Twist, twist, plant. Twist, twist, plant. That's been my mantra for the last couple of days. While waiting for glue to set on an O scale caboose kit, we'll talk about that another time, I've been creating corn fields. Busch makes a very nice plastic cornfield detail item that I got through those fine people at Scenic Express. The kit is a bunch of injection molded corn stalks on base. They've even modeled ears! Since it's cast flat it needs depth, so every stalk is twisted on it's axis a few times along it's length to create a sense of 3D. The parts all received a light coat of flat green paint and once it was dry it's Farmer Brown time! Into the field we go. The nature of the product requires that each strip be glued and pinned one at a time. Makes for very slow progress. Then Woodland Scenics Earth is poured on covering the bases and filling in between the strips. I'm about a third of the way in this photo. My new favorite people are those awesome creative types at Silflor. 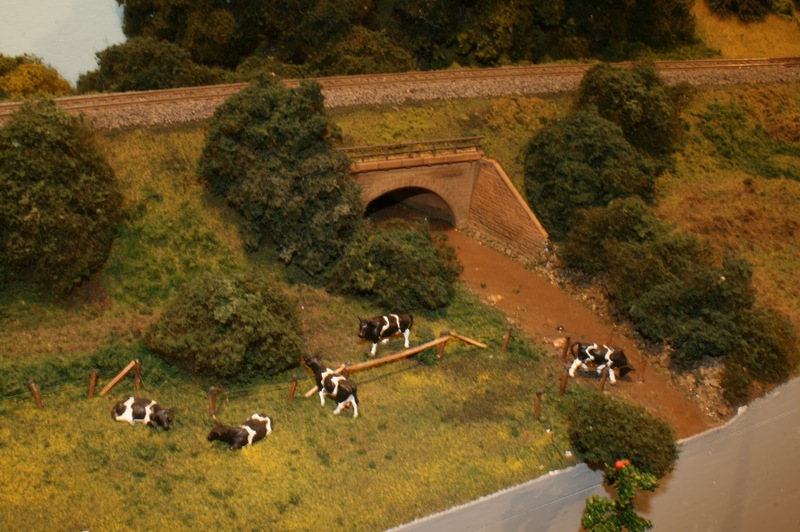 They have created a stunning line of scenery products. I just had great fun creating a small field of crops using their Crop Row product and I couldn't be more pleased with the result. I'll be spending more money with them for sure. I've added a new page to my website. It's a listing of resin cars that I have for sale. I'll be adding items from time to time. Have a look. 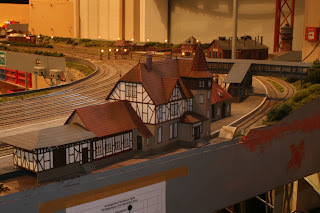 A couple of years ago now, I was in Germany for a Fremo meet in the town of Nordhorn. A truly inspiring experience. The level of craftsmanship was stunning and the collegiality was overwhelming. These 2 images barely scratch the surface. The other thing I came away with was a desire to get my hands on some of their throttles. Fremo uses the Digitrax Loconet protocol for their DCC operations, but have created their own hand held throttles. FREDs. I found them to be far more ergonomic and more pleasant to use than the Digitrax throttles. So I prevailed upon my new friends and I now own 5 FREDs. To assign a locomotive one has to dispatch the address to the FRED via a DT400. The good part of that is no one can steal your address. A good way for guests to run the layout. Given that much of the Wabash traffic along the Buffalo Division was for auto plants, it's no surprise that a few autocars will be required. This car is one of a few styles of 50' autocars the Wabash had built over the years and it is easily recreated using a Sunshine Mini-Kit and a Proto 2K kit. The Proto kits can be found on Ebay and the Mini-kits are usually available at shows where Sunshine is present. The Mini-kit consists of resin cast Superior doors, side sill reinforcement, tack boards, door locks and decals. The modeler has to supply the 50' car kit. Personally I find most of the supplied details from Proto to be too coarse for my tastes. So I've replaced the ladders, bracket grabs, drop grabs, AB brake components, hand brake, brake step, cut lever, etc. The mounting holes in the car body were plugged with styrene rod and puttied as needed. You can also see in the left hand corner the ladders. They are photo-etched stiles with preformed grabs for rungs. I'm really loving how the ladders turn out. The layout of the brake components follows convention. Nothing too fancy. A-Line stirrups are mounted as well. Bracket grabs are from Kadee. These are the best bracket grabs I've seen. And they're cast in a rubber like compound, which means they can take some handling without breaking. The end is detailed again following normal convention with a photo to help. The car is painted with Scalecoat Oxide red and the supplied decals applied. A little weathering and away we go. It's been said by some that resin tank car kits are among some of the most difficult resin kits to assemble well. The major challenge lies in getting the tank to sit properly upon the frame, followed by setting the handrails. Of course this can vary from kit to kit and manufacturer to manufacturer, depending upon decisions made. But to the degree of difficulty, I say BULLOCKS! Compared to the trials of assembling hopper cars, they're a piece of cake. Assembling resin hoppers is an ongoing process of checking square and fighting with cast hopper bottoms. It's remarkable what can throw a car out of kilter as one tries to get the bits lined up. I've just finished 4 hopper cars for a client. With another 4 hoppers almost ready for paint. Once they're done, I'll have to steel myself for the remaining 12 hoppers of his that remain on the shelf. Good thing I have stock cars to keep me going. So this evening I tinkered some more in the one corner east of Aylmer. Planted a few more trees, erected a few telegraph poles. Then grabbed a train out of the staging yard . I think it looks good. Still needs more ground cover. The good news is the bridge will hold a train! Not that I was really worried, but I've had sillier things happen. And yes I know, the grill on 1160 needs attention. Only so many hours in the day. For going outside and making trees. You'll see why outside in a moment. In a previous post, I extolled the virtues of the Super Trees from Scenic Express. But the more I looked at them, the more I was convinced that more work was required, so out they came. I've now got, what I consider an improved approach to using the Super Trees. Once they're dry, they need painting. I use cheap and cheerful grey auto primer. Nothing fancy. We just want to lose the bright natural tone of the armatures. Once that has dried, it's outside for the next steps. I'm using 3M Super 77 spray adhesive for adhering the textures to the armatures. It's very useful stuff. Very tacky, great holding power. But the various chemicals in the can will blow the back of your head off if you inhale it, so it's outside. I started by spraying the armature with some adhesive and then sprinkling ground foam onto the tree. A couple of colours will suffice. Let that setup briefly. Spray again with adhesive and this time apply Noch leaves. These little devils really make the trees stand out. I have 4 colours of leaves and use no pattern for what colour goes over what colour of ground foam. Variety is the key. Let that all dry for a couple of days and then plant your forest. I think this looks much better than the first incarnation. 2012 is becoming the year of the stock car for me. I've built and delivered 2 of these Rutland Car Shops models to a client and I have 3 more under way. Once they're done I have 4 Westerfield NYC stock cars to build for a client as well as 3 Sunshine ATSF stock cars. In amongst all that there's the Wabash stock car project which is getting closer to being ready for release and Aaron and I are working on a Soo Line stock car for the not too distant future. Good thing I enjoy building stock cars! I've always said that best way to get good at sanding resin castings is to build a string of stock cars. I think to date I've built over 48 resin stock cars for myself and others. There's something very fulfilling about watching the side emerge from the sheet of resin, a little dusty mind you. In case you're wondering I work on a sheet of 80 grit sandpaper which is glued to a piece of 1/4" plexi. No glass sheets near my elbows! Some might think that the 80 grit is a tad coarse. For me it makes short work of the process. It takes long enough as it is. I just have to pay attention and not sand through the casting. As in all things, practice makes perfect.